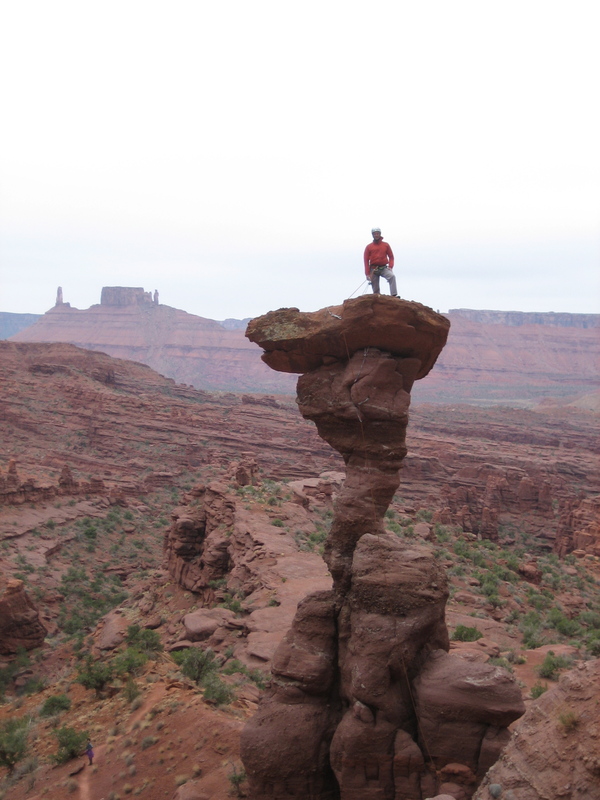 Karina and I have spent the last week doing some climbing tourism around Moab. 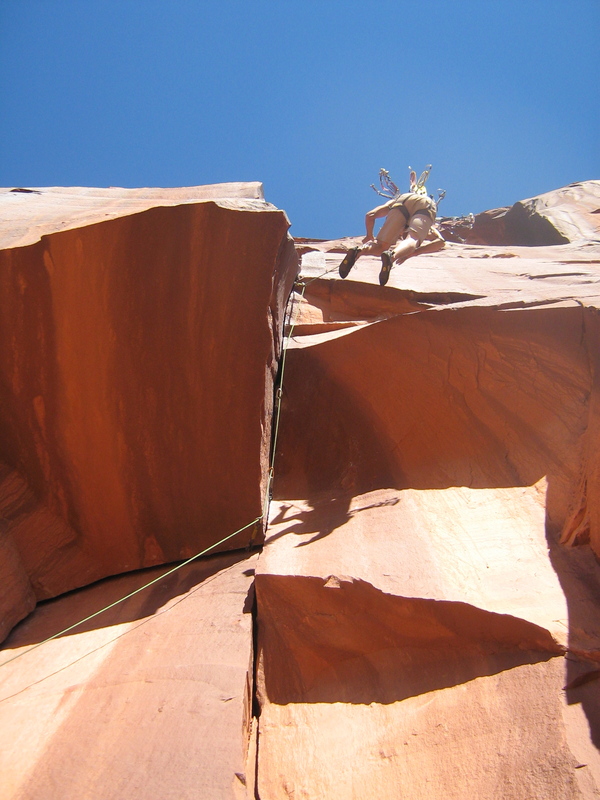 Karina clearly enjoying the wide third pitch of the Kor-Ingalls. 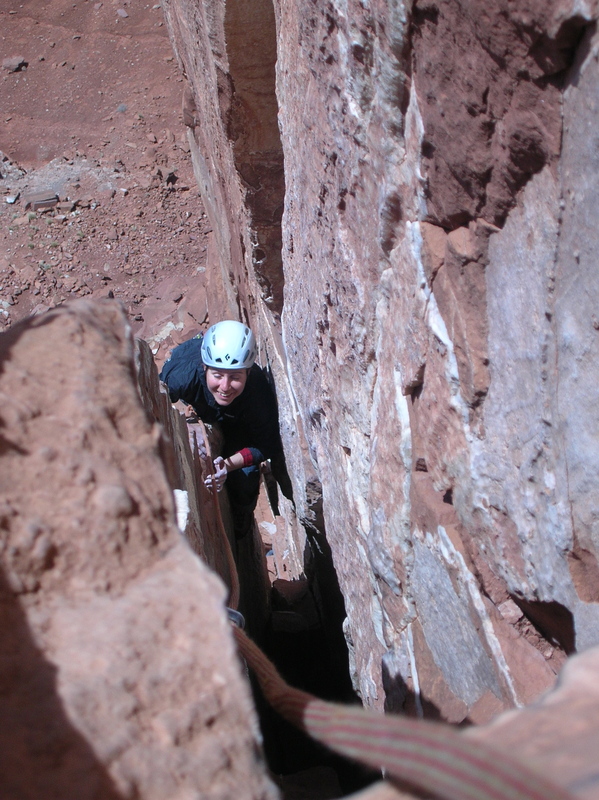 For our first day of climbing we figured that the Kor-Ingalls route on Castleton Tower would make a good warmup. All I’d heard about the route was that it’s really popular, and our guidebook rated it 5.9- so it seemed like it would be a fairly mellow way to ease into our trip. That the route follows a system of offwidths and chimneys and was first climbed in 1961 should have made me a little wary. I did begin to have some doubts when we pulled into the parking lot and saw the size of the talus cone we’d have to hike up to get to the base of the tower. 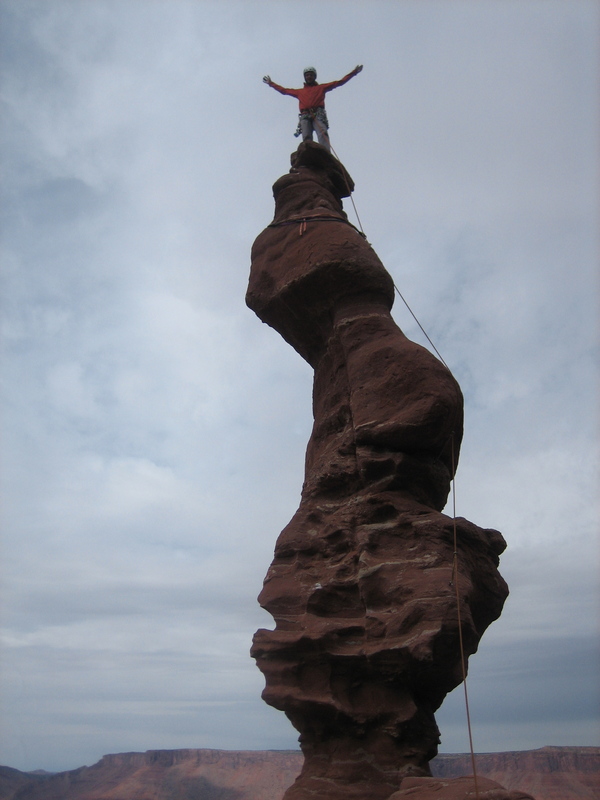 These doubts were further reinforced when Karina got stuck and threatened to vomit while leading the “5.5” chimney on the first pitch. Castleton and some of the other surrounding towers have areas where the sandstone is coated by a patina of hardened calcite. The calcite actually provides some nice edges, but on the Kor-Ingalls these edges are incredibly polished. As I laybacked around the crux offwidth on the third pitch, my foot greased off a glassy knob and I very nearly pitched off. Terrified that my ego would never recover if were to fall, I looked around and noticed that the crack opened in the back into a chimney and that I might be able to slip gracefully into it through a narrow opening. The reality was rather more ignominious; I dove in head first, and then experienced a few moments where I worried that I’d serious misjudged the width of my hips. Eventually I slithered in and before long we were celebrating Karina’s first desert tower ascent on the flat but windy summit. Karina heading towards the Rectory. Fine Jade climbs the sunlit face. The next morning, we hiked right back up the talus cone to climb Fine Jade on the Rectory. It was a beautiful day: windless, not too hot, and we had the route to ourselves. The climbing was also fantastic. Admittedly, some vomiting was threatened on a wide section of the first pitch, but generally it was a day of pleasant hand and finger cracks. We lounged around on the summit for quite a while and Karina even stripped down to her underwear to work on her tan (but for some reason she won’t let me post the photos on the internet). I'm pretty sure no one's taken this photo before. The summit of Ancient Art. 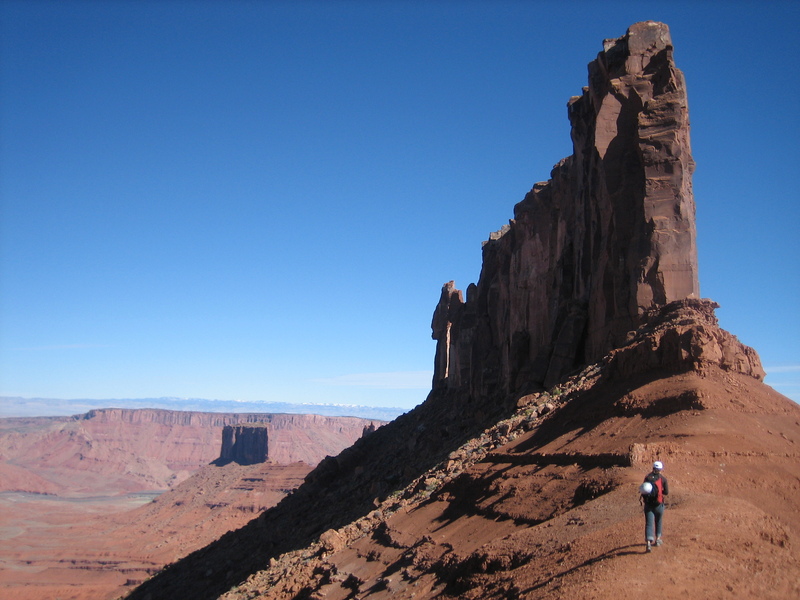 Why would anyone want to climb the grotesque, crumbling mud spires of Fisher Towers? I’m sure that there’s a not particularly flattering psycho-analytic explanation revolving around their distinctive shapes. Also, spires and towers are symbols of the inaccessible. They have no tourist trails up their backsides. They mock the entropic forces of geology, although in the cases of Ancient Art and the Cobra, it’s not clear that they will be doing so for long. Symbolism aside though, the main reason to climb these tottering piles of mud is because it’ll make for a cool photo. The Cobra. Castleton and the Rectory are in the background. We’ve spent the past few days in Indian Creek where it’s been unseasonably windy and cold. Karina has been making quick progress learning the intricacies of steep crack climbing while I’ve been learning that not climbing for months isn’t exactly a recipe for forearms of steel. This is a photo of me from few years ago, but it pretty much sums up my experience in Indian Creek the past few days.